No comment. Photo: Jack Wilshere's Twitter. Well, there isn't much more I can say about the Manchester City game that hasn't already been said by this point. I'm disappointed that such a hard effort from the Gunners resulted in zero points because of a 15-20 minute stretch of sloppiness. But, in all honesty, I'm still a little bothered by the fact that Arsenal looked so disorganized from the time Johan Djourou was subbed off until about the 65th minute, once the damage had already been done. It only takes one mistake to lose a match at this level, and for Arsenal, it was the back four's positioning that cost them so dearly in the build-up to City's only goal. But, that's enough of that. The holiday season means the fixtures come hard and fast (my girlfriend told me to add a "that's what she said" here.) Given Arsenal's injury woes at the back, fixture congestion is probably the last thing this team needs, but after Wednesday's match, they play Wolves on Monday (or Tuesday if the transit strike goes ahead and Arsenal gets their way in moving the match,) QPR on New Year's Eve, then Fulham away just two days later. They'll then have a week off before hosting Leeds in the FA Cup on Monday, the 9th. You can take a lot of positives out of the way Arsenal played at Eastlands on Sunday, but that all means nothing if they then perform poorly in matches they should win. Aston Villa are in 10th place, but have only won four league matches this year. They were lifeless against Liverpool on Sunday. It's a perfect chance for Arsenal to bounce back to their winning ways with three points. Saying that and doing it are two different things. Every fixture during the festive period is winnable. They just have to win them now. defender. And I'm only slightly exaggerating! Arsenal is now top of the table in injuries, with a whopping eight players out due to injury. Kieran Gibbs and Alex Song are not included in that number; the former faces a fitness test and could return to action in this match, having missed almost two months following hernia surgery, the latter misses this match through suspension for yellow card accumulation. One would assume Emmanuel Frimpong would start for the banned Song (merry DENCHmas everyone,) though it could just as easily be Francis Coquelin. Arsenal have announced that Mikel Arteta is available for selection, as he is on four yellow cards and not five, having picked up one with Everton. I count him having picked up two with Everton, so I can't really explain this, but with Song unavailable, it's for the best that Arteta can be picked, and we should all be quiet about it before anybody notices that somebody is counting wrong. Johan Djourou picked up a groin injury at Eastlands on Sunday and is expected to miss three weeks. This, combined with long term injuries to Andre Santos, Bacary Sagna, and Carl Jenkinson, means if Gibbs doesn't pass fit, Arsenal is down to five options for four defensive positions. It does not help that Song, a defensive midfielder that can deputize in the back four in an emergency, misses through suspension. I have not heard much good news regarding Gibbs, and have basically only heard that it's "very unlikely" for him to feature in this one. Other than the wreck at the back, the team news elsewhere is all about the same as it has been for the past few weeks. Projected XI: Szczesny, Koscielny, Vermaelen, Mertesacker, Miquel, Frimpong, Ramsey, Arteta, Gervinho, Walcott, van Persie. 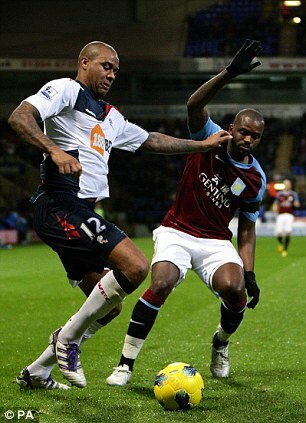 Darren Bent: not fit. Photo: Daily Mail. Darren Bent has not passed fit and will not be available for Villa in this match, as he remains out with a thigh injury. Good news for Arsenal, as he's always had a knack for scoring against the Gunners. He scored three goals in two games for two different teams against Arsenal last season. Bent ruffled a few feathers this weekend by going Christmas shopping during Villa's loss to Liverpool. Villa were lifeless in that loss, but they will have Gabriel Agbonlahor back from suspension. Chris Herd and Emile Heskey are both out, though I have not heard exactly what type of injury Heskey has. It'll be a race against time for defender James Collins to pass fit, as well. Shay Given, purchased from City's bench over the summer, is out until January with a hamstring injury. American Brad Guzan is deputizing in his place. Jermaine Jenas, on loan from Tottenham, ruptured his Achilles in his first start for Villa earlier this month and is out for the rest of the season. Villa were dreadful against Liverpool on Sunday. Things may still seem pretty comfortable for Arsenal regarding their form, but very quietly, the Gunners have won just twice in their last six matches across all competitions. They've lost twice to Manchester City, they're B team was demolished in Greece, and they drew Fulham in the first of those six matches. Their comprehensive league victories over Wigan and Everton are their only two wins over the past four weeks, since beating Dortmund in the Champions League on November 23. Arsenal had also won four straight road games before consecutive set-backs against Olympiacos and City. Aston Villa have won just four league matches this season. They have picked up four points from six matches against the nine teams ahead of them in the table. That includes a win against Norwich, who are currently in ninth. Their other three wins are against the bottom feeders: Blackburn, Bolton, and Wigan. Villa were unbeaten through their first seven matches (with five draws,) but since then, they have lost five, won two, and drawn two. last season. Photo: Clean Sheets All Around. Arsenal have only lost two of their last 25 league meetings with Aston Villa, though one of those Villa victories came in their most recent meeting, which occurred during what I'm going to start referring to as Arsenal's "terrible phase," which lasted from the Carling Cup Final last year to... well, about October. Darren Bent scored twice in quick succession in the first quarter of an hour or so, as the Arsenal defense decided they weren't really going to try very hard for a little while. Robin van Persie picked up a goal late in the match, but it was too little, too late, as the Gunners lost in their final home match of last season. The Gunners did win this fixture last year, 4-2 at Villa Park in late November. Arsenal's four goal scorers that day: Andrei Arshavin, Samir Nasri, Marouane Chamakh, and Jack Wilshere. I can't picture any of the four of them scoring tomorrow, in that Nasri's gone, Wilshere's hurt, and the other two are invisible when on the pitch these days. Ciaran Clark had a brace for Villa; he hasn't played since October. The last time Aston Villa beat Arsenal at Villa Park was December of 1998. 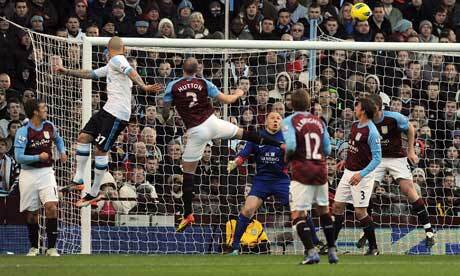 Arsenal took a 2-0 lead in that match before the Villans stormed back to win 3-2. Since then, Villa have lost six and drawn six at home against the Gunners. FA Cup last year. Photo: Daily Mail. The referee is West Yorkshire-based Jonathan Moss. This will be Moss's seventh Premier League match. At 41 years of age, Moss was promoted to the Select Group of referees this year. As such, this will be his first career Arsenal match. 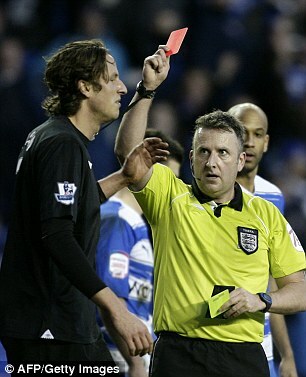 Moss's first Premier League appointment was December 18 of last year, a match between Wigan and Aston Villa, which was postponed because of snow. He ended up working the re-scheduled match on January 25, which Villa won 2-1. Before that, his actual first Premier League match became Birmingham's 2-1 win at Blackpool. In an odd bit of coincidence, both of those sides were relegated back to the Championship. That match took place four days after Moss was in charge of a Championship match between two sides that would go on to be promoted; Norwich City and QPR. Moss has worked four Premier League matches this season: Tottenham's 2-1 win at Wigan, Norwich's 3-1 win over Swansea, Everton's 2-1 win over Wolves, and Swansea's 2-0 win over Fulham. Running one of the lines will be Sian Massey, in her first Arsenal match. Massey was, of course, at the center of controversy when Andy Gray was sacked by Sky Sports for stating off-mic that women did not understand the offside rule. It bears mention that her call to allow Liverpool's borderline opening goal to stand that day was correct. Liverpool won that match 3-0 over Wolves at Molineux. Massey was the head referee of last year's Women's FA Cup final, which was won by Arsenal Ladies. almost always beneficial to Arsenal. Photo: Guardian. The first round of midweek fixtures in the league this season sees two matches today, seven tomorrow (including Arsenal's,) and one on Thursday. Today, Wolves hosts Norwich at 2:45 Eastern, while Blackburn hosts Bolton in a relegation six-pointer at 3:00. As Arsenal plays in Birmingham, there will be six other matches. Manchester City hosts Stoke at Eastlands, in a rematch of last year's FA Cup final and Newcastle hosts West Brom at Mike Ashley's Ego Stadium. Those three matches take place at 2:45. The others are at 3:00, as Everton hosts Swansea at Goodison Park, Fulham welcomes Manchester United to the Cottage, QPR hosts Sunderland at Loftus Road, and Wigan hosts Liverpool a few days after they got a point from Chelsea at home. 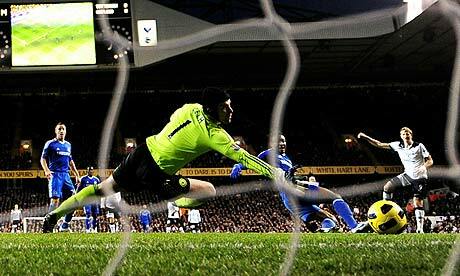 Speaking of Chelsea, they travel to the north of London to face Tottenham Hotspur at 3:00 on Thursday. Honestly, I don't know what to root for in this match. Arsenal is in direct competition with both of these teams for Champions League spots, so in reality, a draw is the best result from an Arsenal perspective.